Biet Simkin knows from personal experience that finding your way to transformation and mindfulness isn’t always easy. Drawing on hard-won wisdom from her journey through addiction, personal tragedy, and the New York rock-n-roll scene, Biet shares the guidance you’ll need to move from meltdowns to miracles. Don’t Just Sit There! is a guidebook that will empower you to dive into meditation by helping you work through the not-so-peaceful side of achieving peace. With insights on forty-four laws of human experience, it provides week-by-week instructions to process each one. From the Law of Focus to the Law of Desire, these aspects of spiritual life can become obstacles without the tools to properly face them. Experienced and novice meditators alike can benefit from Biet’s frank, freeing advice on how to establish a lifelong practice in an often chaotic modern world. By confronting the disruptive quality of spiritual life, you can motivate yourself to realize the meditative practice of your dreams. "Biet Simkin combines a fabulously modern sensibility with an illumined understanding of eternal wisdom. I hope many will both sit and walk with her. She is shining a very bright light on who we are and where we might go." "Don’t Just Sit There is a lovely, wise, and practical guide to being here on earth. And who amongst us can’t use more loveliness as we go through these days?" “Biet is equal parts an unorthodox spiritual teacher, a rebellious meditator and a stand-up comic all in one adorable, eccentric, lovely package. Don’t Just Sit There will get you excited to go beyond where you think you can go. I’m buying many copies and slingin’ them to all of my friends." "This is the guide to meditation for those who want to get stuff done...It’s a different look at meditation and the things practitioners can accomplish." "What I love about Biet is that she fuses 30+ years of study of ancient spiritual wisdom with a youthful, easy to get rock-and-roll voice of a modern leader. Reading Biet's work and working with her has been one of the most transformational experiences for me. She is the David Bowie of spiritual teachers." "Don’t Just Sit There is a necessary rally cry for modern meditators and shares principles that will not only help your mindfulness practice but will up-level your life in extraordinary ways. Her rebellious approach to mindfulness is a breath of fresh air and finally unlocks the true benefits of meditation. A must read." 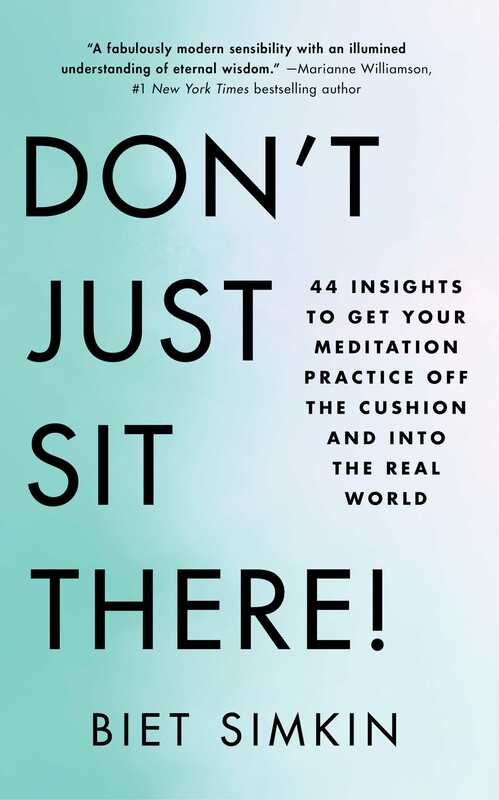 Book Cover Image (jpg): Don't Just Sit There!